Racers and auto enthusiasts use rod ends for a variety of applications. Pit Stop USA carries a huge selection of rod ends and spherical bearings made from mild steel, chromemoly/alloy steel and stainless steel. With the wide variety of steel rod end styles available, PitStopUSA.com is sure to have exact steel rod ends you need for your race car. 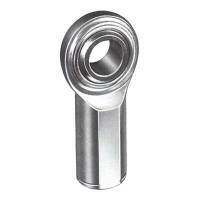 You will find rod ends and spherical bearings made from mild steel, chromemoly/alloy steel, aluminum, and stainless. Special care is taken during every step of the manufacturing process to insure you the highest quality products.